Well, fear not—Qbby is no ordinary box. Using his four startling new powers, you must solve hundreds of puzzles across 18 deadly worlds. Create boxes to climb, hover, warp, and bomb your way to salvation! Whether you're a newcomer or an old vet, thinking outside the box has never been more fun. Scattered across many challenging worlds, Black Smoke and other new hazards threaten to destroy Qbby. Survive vicious winds, viscous water, and more on your mission to rescue the mysteriously cute little wonders known as Qbabies. Each Qbaby you rescue will offer a new power: hit high buttons with a Boxrocket, destroy parts of the environment with a Bombox, teleport with a Warpbox, and even levitate a Remotebox. To the victor goes the goodies: earn new in-game costumes, comics, music, and challenge worlds by beating levels or tapping amiibo. Tap a Kirby™ series amiibo™ figure to receive a costume based on the tapped character! King Dedede box, anyone? Despite the title, Bye-Bye Boxboy does not feel like the conclusion of a trilogy. The second game added more variables to the main puzzle-solving mechanic, but the third entry feels new and different. 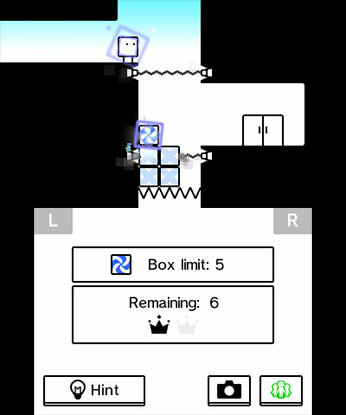 I would absolutely play another Boxboy if it continues to experiment with abilities like it has here. 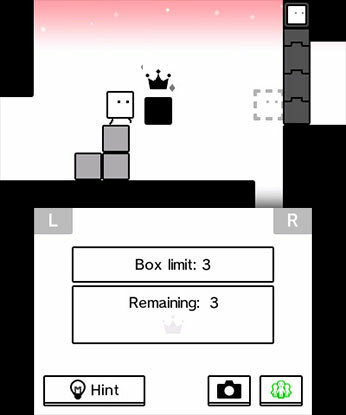 But if Bye-Bye Boxboy does mark an end for HAL’s quirky puzzle series, then it ends on a high note. Bye-Bye BoxBoy! is being billed as the last of the BoxBoy! trilogy and if this is where things truly end I think that’s for the better. Qbby is great and this monochrome world is wonderful, but I feel as though its basic puzzle formula is on the cusp of getting stale. If we do see more of this boxed boy, I hope his next adventure is something more substantial. 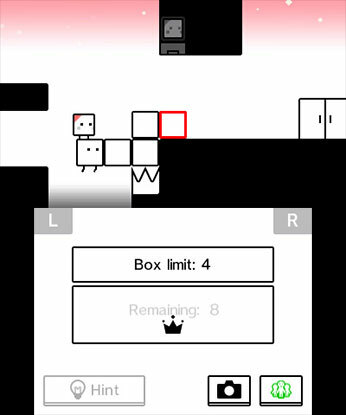 The Boxboy series seemingly came out of nowhere and launched a simple yet challenging puzzle series with an adorable protagonist. Bye-Bye Boxboy gives Qbby a great send-off with some really fun additions to the series despite losing one of the more interesting abilities from the previous installment. With over 20 worlds of puzzles to explore and even more challenge worlds to unlock, Bye-Bye Boxboy will keep even the most seasoned puzzle players busy for quite some time. Overall, I really enjoyed the charm of BYE-BYE BOXBOY and its satisfying ending. Despite only having one save file, I think I will find myself replaying the game in the future. It’s only $4.99 and I would highly recommend checking it out. BYE-BYE BOXBOY! is a fitting farewell to our favourite monochromatic cuboid. Clever, but not too challenging puzzles, a decent if not toe-tapping soundtrack and an adventure that ends before it becomes tiresome make for a winning formula, especially considering the low asking price for a HAL Laboratory title. Bye-Bye BoxBoy! 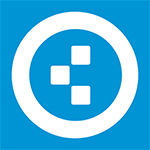 is a fantastic conclusion to a vastly underappreciated series of puzzle games. The 3DS is sailing off into the sunset soon, and with games like Bye-Bye BoxBoy! it will be sorely missed. If you haven’t jumped onto this series yet then now is the time to start, either with this title or either of its predecessors. The game is beautiful in its simplicity, and delivers a solid amount of puzzles to work through, even though it might take a while to hit the tougher ones. This is one of those games that just kept going. There were multiple instances where I thought I just finished the last world and then more stuff would unlock over and over again. The experience is especially well suited to the 3DS, and although this is supposedly the last of the series we do hope some kind of compilation can be made for the Switch. We won’t mind if there’s never another sequel though. For in a world where no franchise is ever allowed to die a dignified death it’s nice to know that Qbby has been all that he can be, and that his final adventure was his best. Para trayectos, para antes de irse a dormir, para cualquier momento en que tengas unos minutos libres… Esta licencia vuelve a demostrar la valía de sus puzles todoterreno en Nintendo 3DS con una despedida que deja el listón muy alto dentro de este particular y a veces menospreciado género. Un juego para poner tu mente cuadrada mientras obtienes diversión al cubo, y por cierto, por sólo 5 euros. Podría pensarse que es un juego poco ambicioso. Es evidente que HAL Laboratory no busca con Bye-Bye BoxBoy! la cuadratura del círculo; solo quieren hacer un juego redondo que sea cuadrado. Son cosas distintas. Hay quien puede echar en falta una mayor complejidad musical o gráfica, pero el apartado artístico casa con el minimalismo jugable. El prescindir de la novedad principal de la anterior iteración de la franquicia, BoxBoxBoy, es decir, el hecho de que Qbaby pueda crear una segunda fila de cajas y la complejidad que esto añade, puede notarse como una carencia, pero se debe a una falta de conjunción con los nuevos elementos introducidos. Bye-Bye BoxBoy! es uno de esos juegos de la eShop de la portátil tridimensional de Nintendo que ningún amante de los puzles se debería perder. El diseño de sus rompecabezas es tan ingenioso como inteligente, sus diferentes mecánicas funcionan a la perfección, las novedades que se han introducido hacen de la aventura una experiencia mucho más variada que nunca y su estilo visual nos sigue encandilando. Comme escompté, Boxboy! revient pour un troisième épisode, mais ce dernier ne se traduit pas par l'ajout d'un troisième bloc. Il s'agit plutôt d'un retour à son concept de base, avec un seul bloc que Qbby déploie afin de former différents ustensiles nécessaires à la résolution des énigmes. L'évolution réside ici dans les Qbabies, qu'il faut aller secourir sur quatre planètes et guider jusqu'à la sortie. BYE-BYE BOXBOY! mantém o elevado nível de qualidade dos seus antecessores com puzzles inteligentes, mecânicas interessantes e muito conteúdo, onde apenas quem já tiver jogado os anteriores poderá sentir alguma saturação. Esta trilogia é assim fechada com chave de ouro, caso seja mesmo o fim da série.